Paranoia (and science ignorance) in the general public can surface unexpectedly for the most surprising reasons. 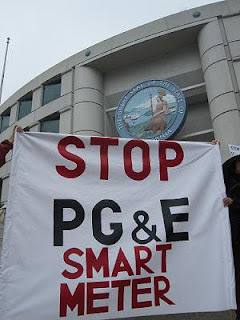 Take for example the latest fear-fest centering around the use of “smart meters” – those monstrous beasts being installed by public utility companies around the country to boost energy efficiency in a myriad of ways. The smart meter is the latest machination of companies like Pacific Gas & Electric here in California to cut costs and save energy by no longer having to employ manual meter readers and allowing consumers to adjust their energy use based on current demand. PG&E does this by installing these new, high-tech devices that contain radio transmitters that send real-time information about power usage directly to utilities and consumers. As an example, on hot summer days when power demand is high, consumers would save money by waiting until evening to run the dishwasher. This kind of awareness in turn could cut the risk of blackouts, ease the integration of clean power sources such as wind farms and solar plants, and reduce the need to build polluting fossil fuel power plants. Everybody wins. But not so fast, modern day Luddites are making a stink. Some reactionary homeowners actually fear the electromagnetic radiation emitted by the devices. This in the day of wireless home routers, electric garage door openers, not to mention cell phones held up to your head, these people are worried about a low-power radio signal. Fear mongers point out that radio waves put out heat, and extreme exposure to such heat has been shown to cause lab rats to lose their appetites. But the heat from smart meters is a very small fraction of the exposure level established as safe by the FCC. Most people are exposed to far more EM radiation from such everyday devices as cordless phones and microwave ovens than they would be from a home smart meter. A knee-jerk reaction of this kind is something to be expected, I suppose, from a general public so accepting of Tea-party-like rhetoric, but come on now. How about picking up an introductory physics text and studying up on EM radiation instead of watching that next episode of The Bachelorette.